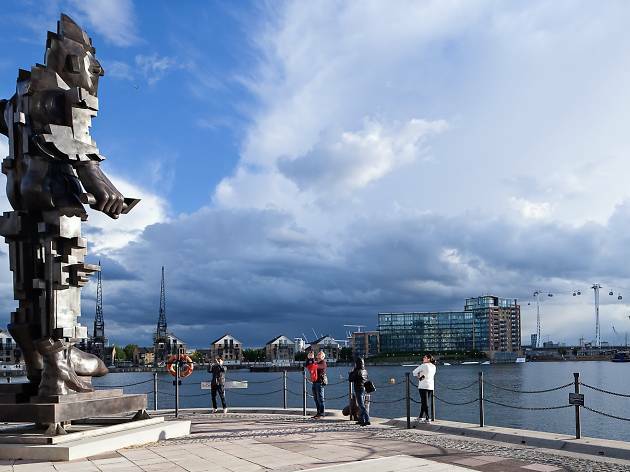 Walk The Line between the O2 and the Queen Elizabeth Olympic Park to see sculptures from Damien Hirst, Martin Creed and Eduardo Paolozzi. London's new sculpture trail will lead walkers along three miles of waterways including London's Royal Docks and along the River Lea. Born from a crowdfunding campaign, the project proposal raised over £140,000 in less than eight weeks to bring existing work out of warehouses and into the public eye. The ten works installed this year will be on loan to The Line for two years, with new pieces introduced each year. Each work will be illuminated at night-time for late strollers to enjoy. Works by James Balmforth and Piotr Uklański are still in the process of being installed. rather than hidden away in private galleries. It's also a great part of London that often gets overlooked. We did this walk on a wet and windy day. The sculptures varied between significant works of art, interesting but not art and the usual ridiculous. Unfortunately most of the walk is through heavily developed areas of East London with little local history remaining, mainly office and apartment developments. The Emirates air line was good value, quite exciting as it was very windy.Probably worth doing if you're bored with nothing to do one day, not worth it if you are on a tight sightseeing schedule Also get a good map as it is easy to go astray.. I cannot rate this enough. We have such an enjoyable day wandering through London and saw so many areas we just go past daily. The sculptures were amazing and really aweing. Ps - look out for the trollies!! I have thoroughly enjoyed reading all these disgruntled (and often snobby) reviews. I thought The Line was brilliant. Yes the map is unusable, yes you have to walk through the odd industrial estate and yes you have to take the Emirates Airline. But I, for one, thought that was part of the fun. This is world class art. In E3. Fantastic! Also most of the walk is stunning, strolling along the Lea Valley Canal and Three Mills Studio on a nice day is fantastic. This is a really fun and unusual walk. It takes you through interesting parts of the docklands you wouldn't normally encounter, it's a work in progress,. As a result you get off the beaten track and it's all a bit of an adventure. We had a great, cheap day out ant and would thoroughly recommend it. It was a very disappointing walk. I started in the South and it practically forces you to cross the river by cable car, you have to walk through industrial areas, it was extremely difficult to find where it started as there are no signs near North Greenwich station and you have to walk quite a lot between sculptures. It was a good idea that was poorly executed. One of the worst projects I have ever witnessed. If you enjoy walks through industrial estates then this is for you. Niche market I would say. Complete and utter rubbish. No sign posts and half the sculptures aren't even there yet. So, unless you enjoy seeing Tescos, industrial estates, other confused people and some abandoned crack dens, do yourself a favour and go sit in Hyde Park instead. Really disappointing activity. Took over 5 hours to do - and were still not able to find half of the sculptures. Some we found had no signs next to them to give us information about it - so not even sure if part of it. Website was awful- not even giving clear basic directions of how to get on the right path and spending ages walking through busy unattractive roads in London- not pleasant walkways in the slightest. I am regretting not reading the reviews before wasting a day trying to view the sculptures. Like others have said the website and map is appalling, we struggled to find the sculptures and even walked past 2 without realising they were part of the trail! (One is a sign post!) we met others looking baffled and annoyed. All in all lots of work needed to make this clearly signposted, information plaques, and maybe a leaflet or two. Waste of time. 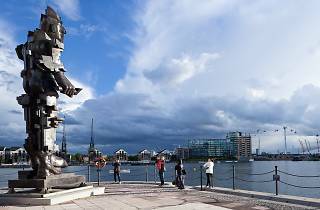 At least 3 sculptures missing (I met one group who said one of the items south of the river was missing: one at Royal Victoria Dock was missing; and one south of Three Mills. Signposting is a joke. Diversions are in place at various points along the route because the organisers still haven't arranged access. One sculpture closes at 4pm. A website that could have been designed by Perfect Curve off the sitcom 2012 - a triumph of style over information. The whole thing is a total shambles, which leaves you wandering round the less attractive bits of Bow. Not recommended - the organisers should be taking a long hard look at themselves. Disappointing! Poorly signed, minimal to no information apart from bumping into other disappointed and lost people trying to find the sculptures. Given the walkway goes through not the nicest areas of London I think promoting that sculptures will be lit at night isn't a smart recommendation at all!